Thank you for considering us for your newborn photography session! We are excited to capture wonderful keepsakes for your family. If you have any questions, please feel free to contact us. We have compiled a list of FAQ as we know newborn photography is something that is probably unfamiliar to you. Stephanie Laura Photography is a professional Cranberry Township Newborn Photographer. Q. When is the best time to book a newborn session? A. In your 2nd or 3rd trimester, while you are still pregnant. Our schedule fills up months in advance and we would like to save room around your due date with a 2-week window before/after for the newborn session. Q. How do you schedule the session since the baby can decide to come at any time? A. Newborn photos are best taken 5-10 days from birth as they tend to be the sleepiest and most poseable. Please contact us within 48 hours after having the baby. We plan on scheduling your session in that time frame. Q. Do you have training in newborn photography? A. Stephanie has training and experience with newborn photography. She took a workshop under a professional newborn photography trainer on posing safety and proper techniques, and she takes online classes and follows the latest safety and posing techniques. Stephanie has also been safely posing newborns since August 2013 professionally for photographs. Q. Why can the session take up to 3 hours? A. If your baby arrives awake and you would like to get asleep photos – this may take some time to get them into a deep sleep so they are content for pictures. I send out a session preparation guide in order to help you to get your newborn to be as sleepy as possible. They have a mind of their own! The more time we allow for the session, the more relaxed and the more poses we can achieve. Some babies like to nurse/bottle feed more than others, some like to sleep the whole time, and some like to be awake and check everything out! Patience is key with newborn photography. Q. Do you provide the props? A. I have many props including baskets, headbands, hats, wraps, blankets, basket stuffers, little outfits, etc. If you would like to bring something sentimental for the photos, please let me know ahead of time. A. Yes! Please feel free to mail a check in increments, use PayPal, or pay in full the day of the session with a check or cash. We do not require a deposit up front, just a $50 cancellation fee once the contract is signed and returned. Q. How long have you been doing newborn photography? A. We are a licensed small business owner and have been photographing and editing newborn photos since August 2013! Q. How did you get into newborn photography? A. We loved having professional newborn photos taken of our daughter. We decided to invest in professional cameras and equipment to take more photos of our daughter and that lead to photography classes, workshops, online tutorials, a variety of lenses, studio lighting, editing software, and an in-home studio with tons of props! Q. What should we bring to the newborn session? A. I will send you a session preparation guide after the baby is born. Otherwise, I provide the props. Sit back, relax and enjoy your time here! People always say how they love watching their little baby be photographed and are amazed at the patience it requires with a (sometimes) squirmy newborn. It is truly an art and a perfected skill to work with little babies. Q. Do you offer prints in addition to the digital image packages? A. Absolutely! If you would like a pricing list on prints, please contact me. I can also recommend a print lab that will do high-quality prints that you as a consumer can use. My goal is for your newborn photos to be displayed at a great quality in your home – whether you print them yourself or go through me with a professional print lab. Q. Why should we choose you to photograph our new baby? A. Because we love what we do! Photography is a passion for us. Stephanie loves to photograph newborns. Art loves to edit the photos. We have carefully selected many high-quality props for the sessions, backdrops, floor drops, baskets, wraps, headbands, hats, and outfits. We love color coordinating the session and we put our heart and soul into working with you before, during, and after. We carefully set up each session, take the time to capture the best photos during the session, and meticulously edit each file that we give you. We know this is your one opportunity to receive high-quality photos that you will cherish forever of your baby. Photography is our creative outlet – we don’t have the pressure to schedule tons of clients since we offer photography part-time (as we both work full-time). We like to maintain a safe, comfortable, and relaxing atmosphere for our sessions. The one word that almost every newborn client says during a session is PATIENCE. Going into this, parents probably have not experienced a newborn session before and don’t know what to expect. Some babies need soothing constantly, some need to be fed often, some poop/pee, some cry, some sleep the whole time, some clench their fingers and fists, some move a lot, some don’t make a peep! Each baby is different, and Stephanie understands this and works with them to get them comfortable. Posing a newborn is something that takes experience, expertise, and patience. Posing a newborn safely and adding props is a creative art. Newborns don’t just get put in a basket and automatically end up posed as you see – it takes time, soothing, and gentle placement down to each little finger on your precious babies hand. Before each session, we set up the room and get it comfortable for your baby – we lay out the props and items. After each session, we take everything down and clean the items that were used. We also take our time in editing each photo to make sure they turn out beautifully for you to print and share with loved ones. This is all included in the pricing on the investment page. We are very appreciative of our clients, and are grateful that you are considering us! We look forward to working with you. Custom newborn portraiture is about the experience. We value the quality of images over the number of images. Please review our portfolio so that you are familiar with our style. Please note all babies are different and specific poses are not guaranteed. We photograph our newborn sessions and milestone sessions out of our Cranberry Township studio. Pricing is subject to change without notice. Please contact me if you would like help stylizing your session and if there are items you would like to incorporate into your photos. Photos typically take 2 weeks to edit as we hand-edit each individual photo and narrow down the highest quality images to edit for you. Total images to select from is dependent upon each child’s cooperation with being photographed. Please peruse our Facebook page and Website to get a feel for our editing style. We do not offer unedited images for purchase due to the nature of the product. 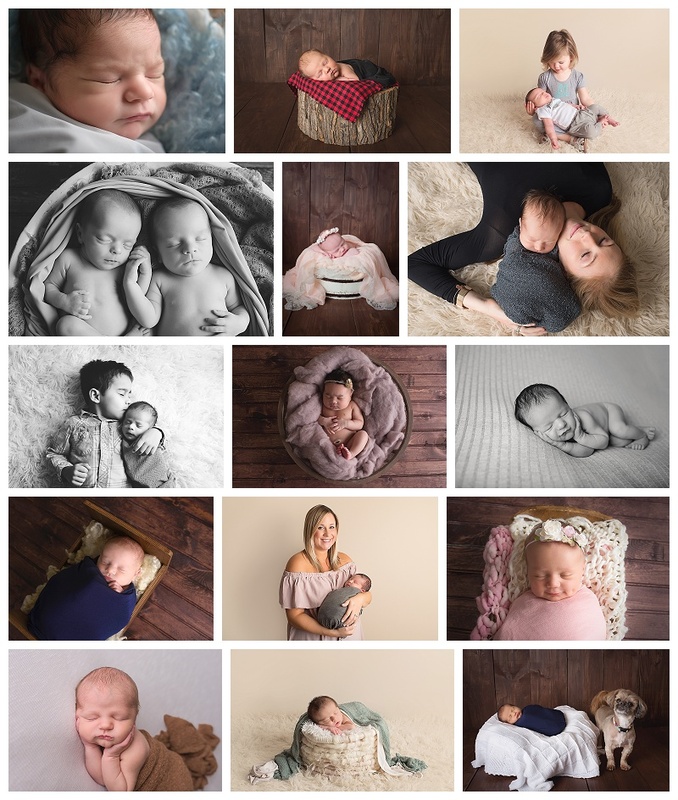 Stephanie Laura Photography is located in Cranberry Township, PA and is offering newborn photography sessions in Pittsburgh PA as well as a child, family, and maternity sessions.